FORT LAUDERDALE, Fla. — Hillary Clinton slammed Donald Trump Saturday for his recent call to allow more guns in classrooms, calling it "way out there" and "dangerous," and accusing the GOP presumptive nominee of pandering to the gun lobby. "Unlike Donald Trump, I will not pander to the gun lobby," Clinton said during a keynote speech at the Trayvon Martin Foundation's Circle of Mothers dinner. "We will not be silenced and we will not be intimidated." 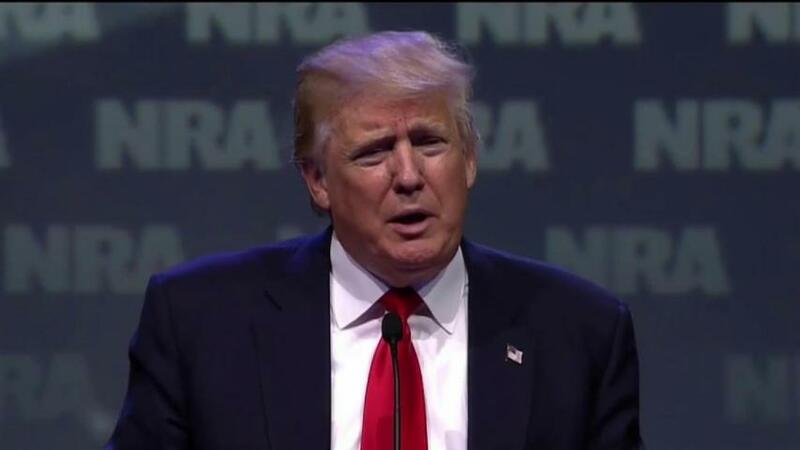 Clinton made the comments a day after Trump was endorsed by the National Rifle Association. "Parents, teachers, and schools should have the right to keep guns out of classrooms, just like Donald Trump does at many of his hotels, by the way," she said. "This is someone running to be president of the United States of America, a country facing a gun violence epidemic, and he's talking about more guns in our schools." In a more hypothetical matchup, Democrat Bernie Sanders leads Trump by 15 points, 54 percent to 39 percent. Looking inside the numbers of her race against Trump, Clinton holds the edge among African Americans (88 percent to 9 percent), Latinos (68 percent to 20 percent), women (51 percent to 38 percent) and those ages 18 to 34 (55 percent to 32 percent). Trump, meanwhile, is ahead among whites (52 percent to 36 percent), seniors (52 percent to 41 percent), men (49 percent to 40 percent) and independents (42 percent to 37 percent). The NBC/WSJ poll — conducted May 15-19 — comes after Trump became the Republican Party's presumptive presidential nominee, but also as the ongoing Clinton-vs.-Sanders Democratic race has become more contentious in recent days. Republicans are now supporting Trump over Clinton by an 86 percent-to-6 percent margin, which is up from 72 percent to 13 percent a month ago, suggesting that GOP voters are consolidating around their presumptive nominee. While Democrats are backing Clinton by an 83 percent-to-9 percent clip, just 66 percent of Democratic primary voters preferring Sanders support Clinton in a matchup against Trump (compared with 88 percent of Clinton primary voters who favor Sanders in a hypothetical general-election contest). Those numbers underscore Clinton's challenge in winning over Sanders voters once the Democratic primary contest concludes. Trump and Clinton are currently the two most unpopular likely presidential nominees in the history of the NBC/WSJ poll. Thirty four percent of registered voters have a positive opinion of Clinton, versus 54 percent who have a negative opinion (-20) — a slight uptick from her minus-24 score last month. Trump's rating is even worse than Clinton's: Twenty nine percent have a positive opinion of him, while 58 percent have a negative opinion (-29) — an improvement from his minus-41 score in April. "This has never been matched, or even close to being matched," Democratic pollster Peter Hart, who conducted the survey with Republican pollster Bill McInturff, says of these negative ratings for Trump and Clinton. By contrast, Sanders is in positive territory. Forty-three percent have a positive view of the Vermont senator, versus 36 percent who have a negative view (+7). One difference Clinton and Sanders: Clinton's rating among Democratic voters supporting Sanders is 38 percent positive, 41 percent negative (-3); Sanders' rating among Clinton supporters is 54 percent positive, 23 percent negative (+31). President Obama's overall score in the current NBC/WSJ poll is at 49 percent positive, 41 percent negative (+8). Asked if they would consider a third-party candidate if Clinton and Trump were the major party nominees, 47 percent of registered voters say yes -- a higher percentage than those who said yes on a similar question in 2008 and 2012. Fifty percent of voters say they would not consider a third-party candidate.